Growing up near Kansas City, I enjoyed lots of great barbecued ribs. 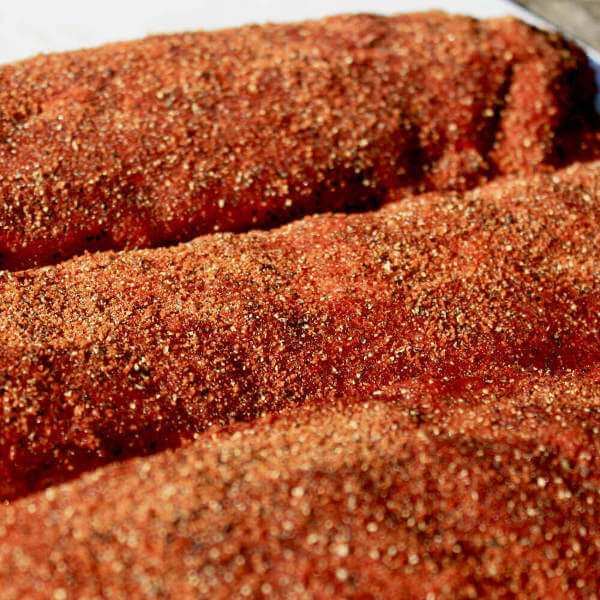 This Kansas City rib rub recipe is where to start if you're wanting to smoked some of your own home-barbecued Kansas City style pork ribs. The barbecue sauce in KC is typically sweet and tangy with the flavors of cider vinegar, brown sugar and molasses backed up by a host of other spices and seasonings. And to complement the sauce, the rib rub used before smoking should contain a lot of those same flavors. The rub will keep longer if the brown sugar is dried before it's mixed with the other ingredients. Spread it on a cookie sheet and let it air dry overnight. Combine the ingredients and store in an airtight container until used. To add more bite to the rub use hot paprika. Season your pork rib slab (a Kansas City Style slab, of course) with a generous amount of the Kansas City rib rub a couple of hours before it hits the smoker. I let the slabs rest at room temperature during that time. That gives them a head start so they finish smoking a little sooner than if they started out cold. And don't forget to make a batch of KC bbq sauce while those ribs are a smoking.